I’ve written in the past about iButtons and my attempts to waterproof them. 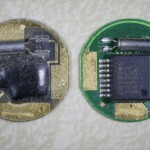 Although iButton temperature dataloggers are fairly well sealed, they are not waterproof. But if you know an old person that used iButtons in the late 90s or early 2000s, they might claim that iButtons are absolutely waterproof. Maxim’s DS1921G iButton Thermochron temperature dataloggers are little silver doo-dads the size of a large watch battery that can record up to 2048 time-stamped temperature values. The internal battery is usually good for a few years of use. Maxim supplies a Java-based application for talking to iButtons to start recording or to download results. This program, coupled with a USB-based iButton adapter, works fine when you’re just dealing with a few iButtons. But I have more than a few iButtons, so I used R to write a script to launch multiple iButtons quickly.